A series of eBook blogthologies. Edited and updated from my weekly blog on business site SmartCompany, these books are part philosophy and part practical advice for achieving your brand result. The Unheroic Work: A blogthology on what you do, how you do it and why the brand is a result. 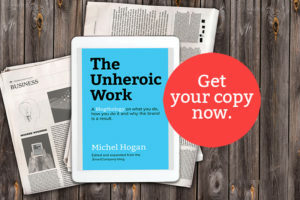 Following on from my first book “Between Making Money and World Peace”, “The Unheroic Work” steps beyond finding your purpose and values and delivers punchy practical advice on how to make them obvious in what you do and how you do it. Along the way revealing how experience keeps or breaks the promises you make, and why people’s unheralded everyday actions and decisions are vital to the brand. Click here for Amazon.com or Click here for Amazon Australia. (for Kindle or Kindle App on any tablet or computer). You can also buy a PDF for $5.00 (+ GST) – you will be redirected to Paypal and then receive a link to download. Between Making Money and World Peace: A brand blogthology on purpose, values and keeping your promises. Click here to buy from Amazon.com or click here for Amazon Australia. You can also buy a PDF for $5.00 (+ GST) – – you will be redirected to Paypal and then receive a link to download. Please let me know when the next book on people, culture and leadership will be available.